Way Out West is a collective of musicians based in West London running sessions at the Bulls' Head in Barnes, one of the longest established pub venues in London. There are also monthly sessions at the Cafe Posk in Hammersmith, an adventurous venue in the basement of the Polish Cultural Centre, which has featured visiting Polish musicians such as Jarek Smietana and Michael Urbaniak. 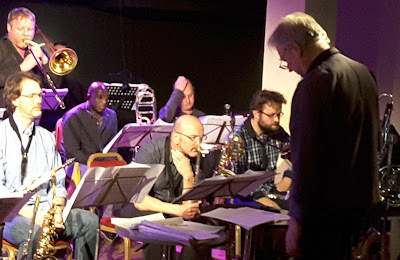 Last Friday night the Posk was standing room only for a rare treat - a gig by Pete Hurt's 17-piece orchestra. I knew of Pete as a regular reed player at the Bull's Head - a fine soloist on tenor in groups led by others, but I soon became aware that he was regarded with awe by other musicians. I found out why when I heard his superb CD A New Start (Trio, 2016). This beautifully recorded album was the first release under Pete's name for over 20 years. He is an outstanding composer and arranger with a mastery of one of the skills that define the difference between a band and an orchestra, namely the ability to "voice" - to obtain a wide range of fresh and surprising music by scoring individual instruments in unusual combinations to produce new and unexpected sounds. It means that the arranger/composer has a much larger repertoire of sounds to draw upon. The great jazz arrangers, especially Gil Evans, possessed this skill. By adding a tuba and a French horn to the standard brass sections of 3 trumpets and 3 trombones and by having his 4 reed players use a variety of flutes, saxes and a bass clarinet, Pete has a greater and more diverse palette of mixed colours at his disposal, and he really knows how to use them. Jazz is, in Whitney Balliet's memorable phrase, "the sound of surprise" and the best music plays with our expectations by playing variations and then teasing us with them, unexpectedly doubling or slowing tempo or dynamics. (Think of Monk's Misterioso or Miles' 1963 Stella by Starlight.) Pete's arrangements and original compositions show an advanced capacity to juggle poly-rhythms as in Triangle with its shifts in tempos, rhythms and unusual harmonic changes. The result ón Friday was a constantly shifting feel to his work, which was challenging, always interesting and brought out the best in the soloists and ensemble. Of the soloists Kate Williams fitted perfectly with the angular but lyrical Triangle, Josephine Davies really shone on tenor on the ballad Thinking of You. The other soloists I would single out included Martin Hathaway, Tony Woods, Mick Foster, John Parricelli, Henry Lowther and Robbie Robson. The rhythm section swung and had a fine grasp on the dynamics of the music and the venue. There was a samba, (Backfoot Samba), a nod towards funky blues (Forbidden Fruit), a ballad for baritone sax and even a rousing jig-like finale Les Parapluies de Stoke Newington all familiar forms but all doing something unexpected. But if the pieces developed in ways which were challenging and surprising, they were somehow logically and organically growing - never strained or gimmicky. Does that mean the music was difficult to listen to? Not at all - the packed house loved it and I can't wait to hear them again.